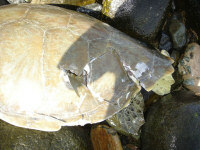 Marine vessels operating in coastal waters can kill or seriously injure sea turtles. 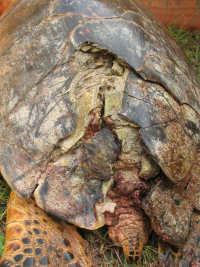 Turtles can be struck by the hull and/or suffer propeller wounds, as evidenced by body lacerations and shell damage. 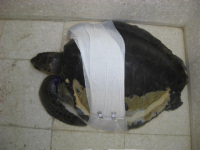 These injuries can affect vision, movement and buoyancy, and may increase the chance that the turtle, now debilitated, will be struck again or attacked by a predator. 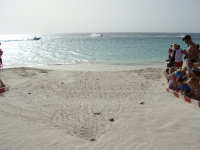 With the rising popularity of coastal tourism, the number of boats and personal watercraft (PWC) traveling at high speeds in coastal waters where wildlife, including sea turtles, are found, has escalated. Boats and PWCs can compromise the general health of the coastal environment by lowering air and water quality. The engines that power boats and PWCs run on gasoline, contributing to noise and air pollution (hydrocarbons and nitrogen emissions). Two-stroke engines dump 25% – 30% of their fuel unburned into the water, creating the familiar “rainbow sheen” on the surface of the water in marinas and other high use areas, and scientific studies confirm that petrochemical effluents negatively affect estuarine flora and fauna. Various restrictions can be implemented to reduce the harmful effects of pleasure craft on wildlife, on sensitive marine ecosystems (seagrass, coral reefs, mangroves), and on the shoreline. For example, some areas are zoned strictly for slow speed (requiring all vessels to produce only minimal wakes and keep the hull fully in the water) and “no-wake” or idle speed (requiring all vessels to move at the slowest speed possible to keep steerage of the boat or PWC and generate no wake). 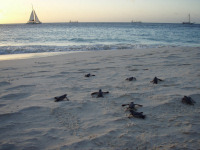 Boats and PWCs can also be restricted or banned from sensitive or high-use areas to safeguard sea turtles and nearshore marine habitats, protect swimmers, and reduce noise, air and water pollution. The use of propeller guards on boats may help reduce propeller strikes on wildlife. However, blunt trauma from a hull strike occurs just as frequently and potentially causes more harm. Thus, an integrated approach is necessary: propeller guards are unlikely to achieve conservation results without restrictions that enforce no-wake zones off nesting beaches and in sensitive nearshore habitats such as seagrass meadows. The slower the rate of travel, the more likely a sea turtle, manatee or human swimmer will move out of harm’s way.